WordPress uses a file called wp-cron.php as a virtual cron job, or scheduled task in order to automate things like publishing scheduled posts, checking for plugin or theme updates, sending email notifications and more. By default WordPress is set up to call wp-cron.php every time someone visits your WordPress website when a scheduled task is present, to basically ask "is it time to do anything yet?". On low traffic sites this is perfectly fine, but when visitors roll in, checking multiple times for scheduled tasks can be very inefficient and lead to resource usage problems for your server, plus make your website load slower. We can easily tell WordPress to let us handle the execution of wp-cron.php with the wp-config.php file. Open your wp-config.php using cPanel File Manager or FTP. Go to the bottom of the database settings in wp-config.php typically around line 37. Now WordPress will not automatically run the wp-cron.php script each time your site gets a new visitor. We don't want to leave WordPress without any ability to automate tasks it might need to do. But at least now that it's not running for every single visitor, we can have way more control over when these tasks take place. For most WordPress users having the wp-cron.php script run every 6 hours is perfectly fine. That would be just 4 executions in a day, compared to possibly hundreds, or even thousands if you had a lot of website traffic that day. 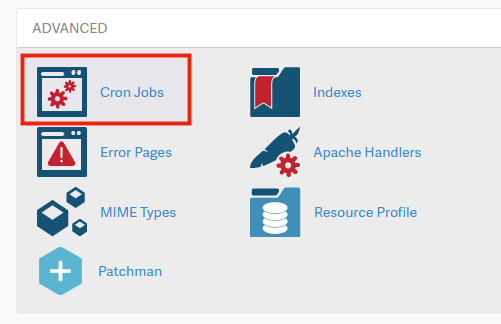 Under the Advanced section, click on Cron Jobs. 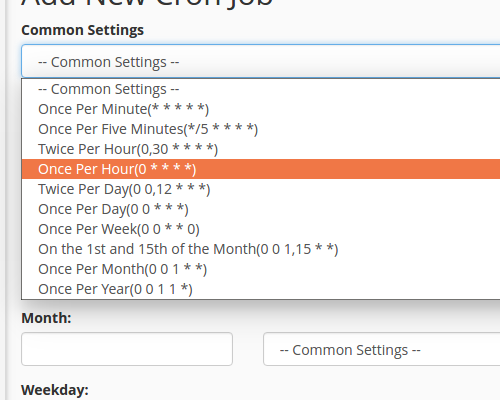 Select Once per hour from the Common Settings drop-down. 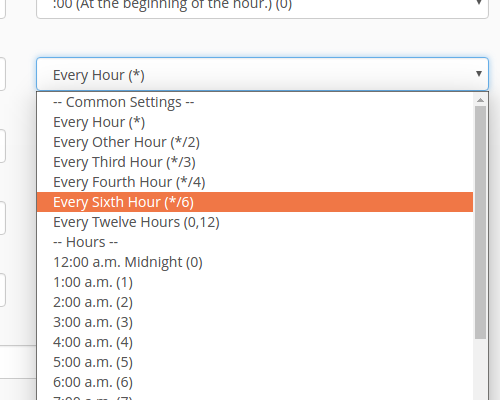 Now select Every Sixth hours from the Hour drop-down. Finally fill in the code to run our cron job and click Add New Cron Job. Where userna5 is your cPanel user name. Keep in mind that the /home/userna5/public_html path would be for a primary domain, if you're using an addon domain, or have WordPress installed in a sub-directory you'll want to be sure to update your path. You should see that your new cron job was added successfully. Now your WordPress website should be safely running scheduled tasks via the wp-cron.php script, but only at set intervals. If you aren't receiving an email when the cron runs, see our guide on cron job not emailing me. The article above instructs to add the code to your wp-config.php file, not the wp-cron.php file. You should be able to see the code referenced in that correct file. so you can spare "technically-challenged" people like me the trouble of looking up what the "-q" option does. I set my cron job up just liek that. Is that OK? Did I need to edit anything else there? works great as written on webhostface hosting environments. Checked using your method of scheduling a post before the time the cron job kicks off. Asesome! So which command format is correct? /usr/local/bin/ea-php56 should be used if you wish to control which version of PHP is used for the script you specify. /home/username/domain_path/path/to/cron/script is an example path to the script you would like to be run (using the version of PHP from the preceeding path). Sorry for the problem with the Fatal error in your WordPress site. The problem appears to be an issue identified in WordPress 4.93. Per some support forums, the best way to resolve it is to upgrade to version 4.94. If you're having a specific WordPress function issue you may need to speak with the developers of the affected plugin, or you may need to post the issue in the WP support form for further assistance. if i update new post in site A.how to get same post in site B? Why would you want to do that? That's duplicate content as far as Google is concerned and would hurt the 2nd website that posts it. Yes, just change the userna5 to be the specific cPanel username you want to use it on. Are there other things which could trigger wp-cron.php to run? I've implemented the fix you recommend and it greatly decreased the number of times wp-cron.php ran. But I'm still seeing it run more than expected. It's running more times than the # of site visits plus the number of times the cron job is scheduled. It's not even close. So I'm trying to figure out if maybe a theme or plugin could trigger it to run, and how I might track that down. Thoughts? You could try enabling/disabling the plugins systematically. Likewise, you could switch to a default theme to see if either of these are affecting it. HI I apologise if I missed the answer somewhere but I have over 300 addon domian sites and waswondering if there is a way to set the wp-cron.php without doing it 300 times. Can I do some sort of root account setting? It is likely possible with some cash scripting, however we do not have any scripts that perform that task currently. The correct version is 'true' or true ? I tried both and wp-cron still active and show up everytime someone visit my site, so the cpu resource is going crazy. It should be 'true' with single quotation marks. Thanks for your reply, finaly this is the only article that works! Another sites tell to put the code at the end of wp-config, well my wp-cron still working. After I tried your tutorial to put the code under database setting, my wp-cron is completely off. Before that wp-cron always running everytime when someone visit my web, so my CPU resource stable at 75-100%, now my CPU resource is stable at 0%-25%. If wp-cron.php is really being visited every time someone vists a page n your site then there is a na issue with the site that you need to investigate or you really have some functionality that is configured to create very frequent scheduled tasks. Simply disabling the WordPress cron doesn't fix anything but just masks whatever the issue is and will cause otehr problems. You state that you "do not need" WordPress cron but on what grounds do you say this? WordPress Core itself uses the WordPress Cron mechanism for important aspects of site operation and many common and popular plugins also use this mechanism for aspects of their operation - by disabling WordPress cron you simply break all of this. So personally I would advise that you investigaet and fix the problem rather than mask it and also break other stuff in the proces, but of course the choice is yours. I had installed the plugin backwup. my backup-way was 'per email'. Because fro the start of the plugn,i got a lot of empty emails, I deinstallated an deleted the plugin, but the cron job ist still working, and it seems with every page load the job starts and sends me an email - I cannot find a way to stop the cron job, adding define('DISABLE_WP_CRON', true); to wp-config didn't help. Do you have any caching installed? If so clear the cache and maybe disable it for now. It is likely just bots. They crawl and hit common pages for whatever reason. wp_cron.php is in every WordPress site, so it could be just testing to see that it exists. Getting hit on any page is not an indication that it is being cased for a hack. Bots do all kinds of things for different reasons. OK so what is the -q parameter for?? the -q switch sets the command to 'quiet' mode, which supresses output. Thanks for your kind help, just a question in my head, how to check if it really worked or not? You may have to check this against cron activity that was previously running. In some cases the wp-cron.php crashes on Windows Server + IIS the PHP.exe which produces an 500 error. You need than to recycle the application pool. So to fix this issue just disable wp-cron.php. Now, my cron working properly. I just want to know if i can run the file insde the theme like this. What exactly is it you are trying to do? Im trying to load a function inside a theme, to grab the data from a xml link. And i want to know if this command from the cron is possible to grab data. As long as your code can access the data then there really shouldn't be any reason that it would not work. 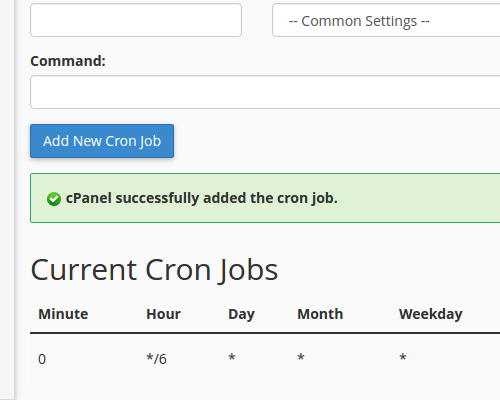 For info on Crons, check out Running a Cron Job. We unfortunately can't provide specific code support, we can try to help if you have specific questions. but is not sending any mail to me related cron, so i'm very confuze that cron is set or not.Also i have aslo run the file in url but also not getting any mail. Please provide me solution urgently. Sorry for the problem with the your Cron job. Unfortunately, the "wget" command is disabled on shared servers. You will not be able to use that command in a shared server, so it most likely the main issue with your cron job. You can use the CURL instead. Check out how to create a CRON jobfor more info. By doing not so much if I set the following code in wp-config.php, is it sufficient? Thank you for contacting us. While this may help, you will have to monitor your site over time to really know. This is because everyone's site performance can greatly differ based on what plugins/themes you are using and how much traffic. It does not describe the consequences of turning off chron, why I might do so - especially since I have no idea what triggered the need to do so, as I do not get any serious volume on my site. This is what we have above: "On low traffic sites this is perfectly fine, but when visitors roll in, checking multiple times for scheduled tasks can be very inefficient and lead to resource usage problems for your server, plus make your website load slower." Did you have any more specific questions we can answer for you? If I disable the wp-cron.php, and set cron job for every 6 hours, would it effect the comment left by my visitors? Does the comment appear only at every 6 hours? And also the scheduled post will be posted only 4 times a day? Nothing it worked perfectly and was a great answer. Its pretty solid. nice work. I appreciate you taking the time to put this together. Thanks for the article. I've been experiencing some brief timeouts that are happening in the wee hours of the morning on certain sites. After looking at the logs, I suspect the wp-cron combined with some system maintenance. At the very least this will narrow down the problem. But, hopefully, it will fix it. I am not quite sure of your situation. Are each of those separate emails or are you getting emails with nothing but errors? Some of the errors appear to be plugin related. This can be specific to that plugin or possibly caused by other plugins interfering. You will want to test each plugin individually and then together in combination to see if there are any interference. Which later change to this, after i made some changes by adding my domain. The path '/home/xxxxxx/healthable.org/public_html' appears to be incorrect. It should be '/home/xxxxxx/public_html' if your domain is the primary domain, or /home/xxxxxx/public_html/healthable.org' if it is an addon domain. Alright Thanks... let me try this. Thanks for article. You save me from zombie. Thank you for your suggestion. If you are interested in posting an article in our User Submitted section, I would be happy to link to it. @Hansel - your article perpetuates the myth that wp-cron.php is caled by WordPress on every visit to a site. Rather than repeating falsehoods I would suggest you do your own homework, understand how it really works and then corect your article. As for your technique, if you want to repeatedly call wp-cron.php for absolutely no reason and thus use more hosting resources rather than less then it's up to you. I suppose if you actually have 144 WordPress scheduled tasks you want to run every day on every site you have then you may justify it - but do you really? If not then you are simply wasting resources and if you don't understand why that might be the case then you might want to review your understanding of WordPress and how it handles scheduled tasks and what happens every time you call wp-cron.php when you don't need to call it. I followed this advice after a support session. You bet it helped speed up the site, but what good is a fast site if it no longer does what it's supposed to? Thank you for contacting us. While disabling wp-cron can help speed up your site, it is just a suggestion. If it is causing problems with your site, it may not be the best option. Our guide on Optimizing WordPress provides several other suggestions for speeding up your site. Be sure to double check and ensure you followed the instructions correctly. If you feel so, then comment out the line you added. Does it still give an error? While your article does explain a good place to put the directive, I figured I could just add it to the very end of the file. I learned the hard way that the order lines in of wp-config.php is actually important. Yes the placement of the code in the wp-config.php file is important, that's why in this guide it states to look around line 37 for the Database Collate section to place it directly under. I'll try to update the guide to make it a bit more clear that this is required. Thanks for the comment and letting me know! What was the plugin that you deactivated that starting causing this error, and if you re-enable it, do the errors go away? Most errors I see regarding Illegal offset in WordPress are from years ago. Are you running the latest version 3.9.1 of WordPress currently? You might want to try upgrading if not to see if that helps. Otherwise it sounds like possibly your plugin that you had activated might have modified the cron.php script in a way that WordPress is not expecting. If that is the case, you can make a copy of your current /wp-includes/cron.php file and then download a copy of cron.php directly from WordPress to ensure you have a unmodified original version of it. Please let us know if you're still having any issues. Are you getting this error every single time the cron runs, or was this just a one-time thing? That error is in regards to the virtfs or Virtual Filesystem and seems to also be discussed here on the cPanel forums. It basically sounds like a stale lock file, but I don't see it on the server anymore. If you continue to see this issue pop up, please submit a ticket so that our system administration team can review why this might keep happening. One way you might be able to prevent this from happening is by staggering your cron job runs as well. It looks like you have a bunch setup to all run every 6 hours at the top minute 0 of the hour. Maybe go up a minute for each to ensure that one can completely finish before another starts. Thanks for your reply, yes i have a bunch of wordpress addon domains for which i am following your guidelines to reduce cpu load on the shared server. 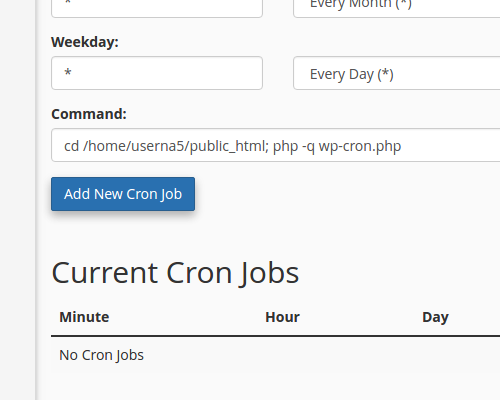 So I just followed the instructions in the tutorial to manually add the cron jobs for each wordpress site. I will try your suggestion and see if it makes a difference. If not I will create a ticket to see why this is happening. Sorry for the delayed response, we have to approve comments on articles before you can see them to make sure people don't include any sensitive information in their questions. So that's why you didn't see your comment posted right away. If staggering the cron jobs so they don't all run during the same minute works, please comment back here and let me know. I can go ahead and update this article itself for other users that have multiple WordPress installs to make sure they don't run into the same problem if that's the solution. Not sure about the first one, but the second one looks like an error! Thanks for getting back to us, glad to hear that staggering the cron job runs seems to have gotten rid of your first issue. However it doesn't look like you have a /public_html/admin/cron.php file, so that's why it's telling you No input file specified. I see that you do have a /adminold directory, so possibly you forgot that you renamed this directory after setting up the cron job? For the second error, it looks like your wire-writer.com cron run is failing due to the WordPress Simple Paypal Shopping Cart plugin that you're running. So it does seem related to something the plugin is trying to do with sessions. Doing a Google search of this issue I stumbled across this WordPress Simple PayPal Checkout Plugin Broken post on WordPress.org. However I attempted to run that site's wp-cron.php file directly and was not encountering this issue. So I'm not sure if it is tied somehow to it being run from a cron job which would be odd. I see that the site's cron job has run 3 times already today, are you encountering this error being emailed to you every time, or is it sporadic? I'm experiencing the same issue and it is definitely connected to cron job being run. The rest of the time WordPress Simple Paypal Shopping Cart is working smoothly and without any errors. I renamed the adminold folder back to admin, I don't remember renaming this folder, I will see what happens now.I am getting the other error every 6 hours by email. when I try the wget method, I just get an error that I don't have permission . . .
That is correct, wget is disabled on our servers. You can, however use the cURL method. You can see the format for that here in our Cron job article. I get no errors at all when I visit truthsaves.org/wp-cron.php. I get nothing. No page load -- just a blank page. BUT . . . I have success using the curl method! THANK YOU! I am testing the curl method right now and was just able to get a scheduled post to work! And no error messages. Thank you very much! Apparently it's connected to the botdetect captcha plugin. But I know nothing about this stuff. Does this mean the cron job is not running? Should I go back to using wp-cron.php? Or should I just ignore these errors? Do you get the same error when just trying to access the wp-cron.php script directly? If you disable the plugin does your cron job run without errors? I don't know what you mean when you say, "Do you get the same error when just trying to access the wp-cron.php script directly"
I did everything exactly as the article states. When I disable the plugin I don't get an email that anything has happened. No email so that must mean the cron job is running but wp-cron.php has nothing to do. As soon as I re-enable the plugin the error messages begin again. I'm guessing this means the cron job is not running when that plugin is enabled? Jacob means do you get an error message when visiting "http://example.com/wp-cron.php" itself? Unfortunately the original premise of the post is incorrect, which rather invalidates the main thrust of the topic. If you would actually check in WordPress rather than simply regurgitate misinformation that you read elsewhere you would know that WordPress does not call wp-cron.php every time the site is visited. WordPress only makes a loopback access to wp-cron.php when there is a scheduled task due to run. I just thought I'd emphasise that so you'd be clear where the error in your original premise was. In fact if you disable WordPress cron and instead rely upon server cron you can end up increasing the resource usage for a site. Just thought I'd emphasise that since the major claim of the post is the opposite. If you don't understand why I suggest you run through some use case scenarios (and remember that a direct access to wp-cron.php is basically like any other site access and WordPress runs through it's whole initialisation. The simple example of having a server cron run 4 times a day may not increase resource usage but it certainly isn't going to decrease it. But is 4 timesa day really valid for the type of high-traffic site that the example is pinned on? I would suggest considering something more realistic. There is a place for a well targetted server cron to fire once at a specific time to trigger a periodic task that you know will be due at that time - but use this in conjunction with WordPress cron. The only other time you might want to use a more frequent server cron is if the hosting doesn't support http loopbacks and you are required to enable the WordPress alternate cron to haev WordPress cron work (if this is required then this is a bad host and you shouldmove anyway). This has the unfortunate side effect of sometimes making additional nasty query strings be visibly appended to urls that a site visitor might see and only in that case and only if you didn't like that effect would you consider a more frequent server cron, but you'd have to take the hit of increased resource usage compared with using WordPress cron. I used this method, and added wordpress to the root after username, but i get an email saying NO input file specified. and i get it after every hour. This means that your reference to the file is broken. Could you provide me with the exact line of code that you have in there for your cron job? The wp-cron.php file is always in the same place within the WordPress installation. Be sure that the path you are referencing in your cron job is the exact path of your WordPress installation. Yup, as i have copied the code from above, there s space after cd . does it have to be there. In the code provided, yes there should be a space after the cd. My host sent me a message 15 days ago saying that "multiple wp-cron processes running from previous days" had caused a resource shortage on my server. A quick google search led me to your website and I applied the line of code in wp-config.php exactly where you suggested. This morning there is another warning message in my inbox saying the same website's wp cron had caused a resource shortage. I checked wp-config.php and verified that I had entered the code correctly. Any suggestions why wp cron is still doing this despite that it has been disabled? This line within your wp-config.php file will completely disable the wp-cron. It is, however, possible that if you set up the additional cron job, that you set it to run too frequently. If you only disabled the wp-cron and are still getting these messages, I recommend speaking with your host for more information as it should no longer be running anymore. I do have a *real* cron job on that site, however it runs only once per day at 3am, but it has nothing to do with wp-cron.php. If you've followed the steps here correctly to disable it, the only person who would be able to give you accurate information on it would be your host. If you've disabled the WordPress wp-cron.php inside the wp-config.php file, but it's still running, this could be caused by one of your plugins. Especially if it is a matter of your wp-cron.php script hanging and causing a lot of usage. If you are on a cPanel host you should be able to access your raw access logs and take a look for the wp-cron.php requests in you logs. This might help you narrow down what is still triggering your wp-cron.php executions even though they are disabled upon running every visit. I have a number of WordPress sites on my IMH account. Is this a "one size fits all" sort of thing? i.e. Will this make all my sites run a chron job at the same time? Most of my sites are in folders (like public_html/qrs/wordpress2, public_html/xyz/wordpress3, etc ) Is that a problem in any way? This change will only affect the WordPress site that you make the change on and will not affect all other WordPress sites. You will need to make the change on each site if you want it active on all of them. Sorry to be a pain... But I'm not absolutely sure we are on the same page. If you'll indulge me, I'll see if I can do this more graphically.. I'll use 3 sites in the example but only "flesh out #2 as my poster child. Each site is a separate addon domain. Yes? I just want to be sure to get it right! Your wp-cron.php file is directly inside the WordPress directory for each site, in which there would not be a separate folder inside it with additional WordPress files unless you have some sort of additional custom setup. If you take a look inside each WordPress installation, you will see a file named wp-cron.php. This is the file that needs to be referenced in the cron job for each site. OK... It sounds like the correct path is to the location of the actual wp-chron.php file. I think the misscommunication is about giving WordPress it's own folder - routine for me as it's a small but incremental plus for security. Here's the wordpress.org skinny on it. this tip helps a lot with dealing a monster site. No problem at all laishaoyi, glad it helped out! Hei Jacob what is the point of setting 1 hour in creative settings that goes off when you select 6 hours from the drop down? The reasoning behind this is to run it every 6 hours, and only one time in that 6 hours period. He's right though. The tutorials tells you to set "Common settings" to 1 hours, and after that specifies every 6 hours. Doing this deletes the common setting. Step 3 is not needed. At least on the latest cpanel. Check you'll see. userna5 ===> user name CPanel ? or DataBase ? or Wordpress ? Hello nowadays, and thanks for your comment. I've gone ahead and updated this article to be a bit more clear. The username for the /home/userna5/public_html path as mentioned now, should be your cPanel username, or the physical path to your WordPress installation on your server. I've seen the wget method you've mentioned also recommended around the web, but I've also heard people complain if it causing problems for them. So you might want to stick to the sure fire way of directly calling the script locally that is used in this article. Generally it's better to trigger cron from the command line than web because web often has a more limiting max execution time than command line.